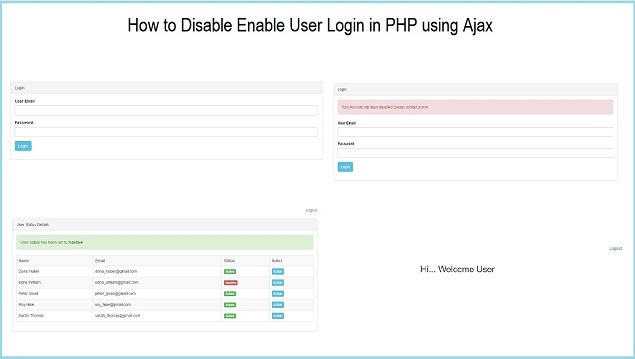 This is one more web development tutorial by using PHP with Ajax and in this post we are going to learn How admin user can disabled login of any particular user and how he can also enable login of particular user by using PHP script with Ajax Jquery and Mysql. If any sub user login has been disabled by admin then he can not login into system and he has no rights to access system only if admin can again active his login on his end. So this type of topic we have learn in this post. We have already discuss many topic on PHP login system but here we have first time seen how to disable or inactive particular user by admin. This type of feature is mostly required when we have developed any web application in which there are master user who has all rights to disabled or enable login of any sub user and in that application there are many sub user who can use system. So when admin want to disabled any particular inactive user login then he can easily disabled particular login on single click. In this system master user can view all sub user details and he can also rights to disabled any user login. So after disabled that particular user will not access our system. This things we have made by using PHP with Ajax. For make this type of system we have use PHP script. For make login script we have use encrypted password, so in this system all password has been stored in encrypted form and this password has been verify by using password_verify() function. Here for login we have use pure PHP server script and then after if suppose master user has login into system then he can view all sub user details with one action button, by clicking that button master user can enabled or disabled particular user login. For load all sub user details we have make jquery function with ajax request and that request has fetch sub user data from user table and display on web page. Then after for disabled and enabled login of sub user while admin click on action button and on that event we have also use Ajax request which send request to server for enable or disabled user login. So for this event we have also use ajax request with PHP script. So this way we have make simple User login enabled and disabled by using PHP script Ajax. Source code of action.php Please!